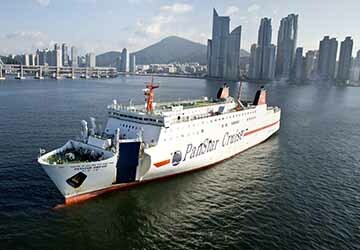 The PanStar Cruise ferry service provides three ferry connections a week between Osaka, the commercial and cultural centre in Japan and Busan, the largest port in Korea. The PanStar ferry has been widely used since around 2002 and provides a great method of travelling between these two cultural different countries. Due to their relative proximity it’s possible to make the crossing in less than 24 hours too which contributes to its popularity. Few ferry services in the region can boast such a wide range of facilities as found on the ferry used on this route - PanStar Dream. The ship is a twelve storey floating hotel and features a buffet restaurant and cafeteria, a selection of cabin accommodation to suit all budgets, evening entertainment and you can also find brand-name products in the duty-free shop. If that’s not enough then a variety of must-see views will keep you entertaining during crossing between Osaka and Busan. Direct Ferries provides a ferry timetable and price comparison, based on your search criteria, allowing you to compare Panstar Cruise products with multiple ferry company timetables and fares in one search. Compare Panstar Cruise timetables and prices now with all alternative ferry operators before booking your ferry ticket to ensure you get the best option for your ferry trip.